Jaipur is an intriguing tale of grand palaces, magnificent forts, exquisite temples, colorful bazaars, and a vibrant way of life. Its rich cultural heritage including its cuisine, fairs, and festivals are a gateway to experience the fascinating spirit of the city that is unlike any other. As you make your way through the buzzing cityscape, you will be drawn into a world where the past and the present blend beautifully. 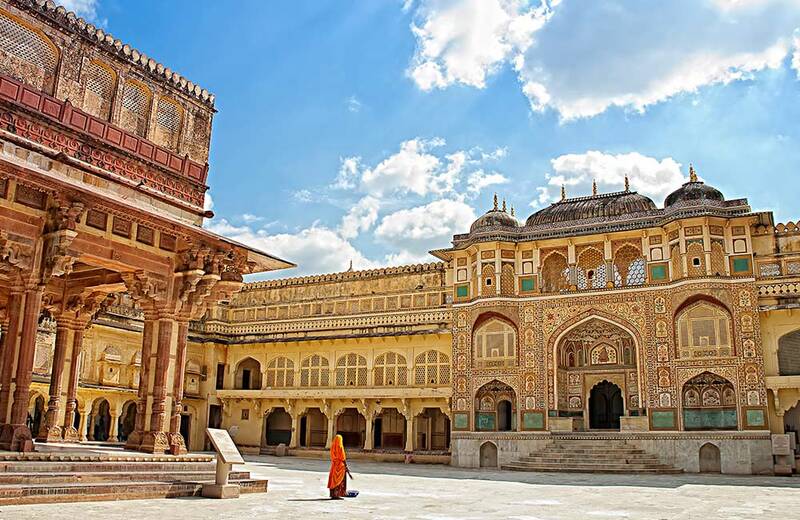 A traveler’s paradise in the truest sense of the term, Jaipur is everything you imagine a holiday destination to be, no matter when you visit it. There’s no doubt that a trip to Jaipur is a delightful adventure. But which is the best time to explore this majestic capital city of Rajasthan? When can you experience the city in its regal and flamboyant best? While you can visit Jaipur all year through, the city exudes its charm in unique ways at different times of the year. We reveal to you the best time to make a trip to Jaipur. Jaipur, also known as the Pink City, is situated in a semi-desert region. The city experiences three distinct seasons, namely summer, monsoon, and winter. Thanks to the hot semi-arid Jaipur climate, summers are dry, hot, and sunny in this city. You can expect the average temperature to hover around 44 to 45 degrees. Hot winds blowing through the city is a common feature of Jaipur summers. Most travelers believe that summer is not the right season for a Jaipur trip. Well, you can play this up to your advantage! Let’s be honest, who doesn’t love a good deal? Since the inflow of tourists takes a beating during this season, prices come sliding down. This is one of the best reasons to visit Jaipur in summers. Add to that the advantage of the easy availability of tickets (that too at slashed down rates), less crowded tourist destinations, and a clear sky, and you are in a total win-win situation. So, basically it’s not just about the deals, it’s also about experiencing the city minus the crowds. Do remember to pack light cotton clothes and keep yourself hydrated in the Jaipur summer. During the monsoons, Jaipur receives low to medium rainfall. With the rains, the city gets relief from the scorching rays of the sun. Many travelers wonder, is July a good time to visit Jaipur? The answer is, yes! Not just July, a trip to Jaipur in September is also a great idea. It is when monsoon bids goodbye to the city. In fact, August is the wettest month in the city, but since the rainfall is not very much, visiting Jaipur in August is also recommended. Though monsoon is short in Jaipur, it comes with its own set of advantages for travelers. For starters, it is the perfect time to explore Jaipur without having to dare the sun. The flow of tourists doesn’t pick up speed in this season, which prompts airlines and hotels in Jaipur to offer their services at discounted rates. If you are a budget or laid-back traveler, monsoons are the ideal time for you to plan your trip. Minus the touristy crowd, you have a better chance of exploring the attractions of Jaipur at your own pace. The best part is that the monsoon rains do not lash down on Jaipur right from the morning. Often, you can find the rains falling late in the day, making it possible for you to explore the attractions in and around the city during the morning hours. Low temperature and a cool breeze make winter the best season to visit Jaipur. Days are pleasant and nights are cold from the period starting from October till March. This is the time when tourists flock to the city and you can find people from all over the world exploring the attractions and posing for selfies everywhere. If you want to experience the Pink City in a pleasant weather, winter is your best bet. Apart from exploring the places to visit in Jaipur, you can also attend some of the famous festivals in the city’s cultural calendar. Also, you can indulge in shopping in the evenings and cater to the shopaholic in you with loads and loads of colorful artifacts. However, make it a point to pack in some woolens for the winter nights as the city can become as cold as less than 4 degrees here. Romancing in the Pink City has its own appeal. From the palaces and forts in Jaipur to its lakes and gardens, there is a lot you and your partner can explore and experience in this fairyland. Now, the question is when do you plan your romantic trip to Jaipur? The answer to it depends on how you and your partner would love to explore the city. If you both prefer a romantic sojourn away from the crowd, anytime between July to September is a great idea for your trip. Imagine experiencing the aura of Jaipur as you walk through a rain-lashed evening holding your partner’s hand! Well, there are lots of things you can experience in Jaipur during the monsoons. For instance, you can enjoy a romantic dinner at one of the 10 iconic restaurants in Jaipur or witness a folk dance performance or a puppet show or visit a nightclub…. the options are many and varied. For those who would rather soak in the sounds and sights of the city in a pleasant weather, the best idea is to plan your trip from October to March. As Jaipur comes alive with a festive spirit, you too can bask in its aura and create lasting memories. Jaipur Literature Festival: The annual Jaipur Literature Festival is a star-studded show where literary moguls, as well as newbies, participate with equal interest. If books are your calling, do not miss the chance to attend this festival! Jaipur International Film Festival: Sparkling jewels of world cinema descend on the land of Jaipur during this festival. If you are interested in enjoying cinematic wonders other than that of Bollywood, this festival is your chance to do so. Kite Festival: Each year, spring is welcomed in Jaipur with a colorful Kite Festival celebrated on the Makar Sankranti day. Plan your trip during this time to engage in a kite battle and celebrate by snacking on the local sweets and delicacies. Jaipur Photo Festival: If photography is your passion, here’s the perfect event for you to enjoy. Several photographers from around the world display their work and engage in interesting talk sessions during this festival. Elephant Festival: The elephant festival involves a wonderful procession of elephants, horse, camels, and folk dancers, all decked up in finery! But that’s not all. 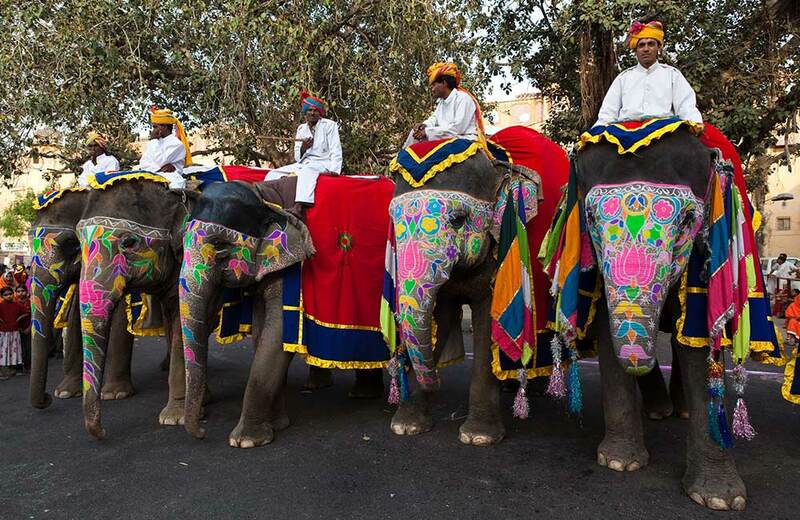 You also get to see elephant dance and elephant polo in this unique festival of Jaipur. Gangaur Festival: An unmistakable feeling of merrymaking and celebration fills up Jaipur during the Gangaur festival that spans over sixteen days. The festival is observed in honor of Goddess Gauri and is marked with a vibrant procession in Jaipur. Teej: Teej celebrates the union of Lord Shiva with Goddess Parvati. Apart from engaging in folk songs and dances, swings are set up around trees. The whole city comes alive during this occasion and becomes a visual treat to watch and experience. It goes without saying that Jaipur is a statement in Rajasthan’s beauty and cultural heritage. Its varied attractions make it a highlight of the 5-day Golden Triangle tour that involves Delhi, Agra, and Jaipur. Whether you are planning an exclusive trip to Jaipur or combining it with the places to visit in Delhi and other cities in Rajasthan, make sure to book your travel tickets and hotels early on to avoid last-minute rush. So, what are you waiting for? Check your holiday calendar, plan your trip and get set to go! 4 Haunted Places in Jaipur and Nearby Region – Get Your Spook On!